Is married.....wife's name is Johanna.....they have a son, Christopher, and daughter, Fiorella. Batted .253 with 9 HR, 29 RBI and 11 stolen bases in 132 games with Milwaukee ... Made 66 starts at six positions (25g at 2B, 15g at SS, 11g at 3B, 7g in LF, 7g in RF, 1g in CF) ... Pitched in relief on 4/5 vs. Chicago-NL (0.1ip), 7/22 vs. Los Angeles (2ip, 1h, 1bb, 1k, 1hbp) and 8/2 at Los Angeles (1ip, 6h, 5r, 5er, 1k, 1hr).....now has 4 career pitching appearances ... Batted .214 (3-for-14) with 2 RBI in 9 games during the postseason ... Played for Aragua in the Venezuelan Winter League ... Signed a 1-year contract on 11/30, avoiding arbitration. Batted .259 with 14 HR, 51 RBI and 13 stolen bases in 136 games... Made 98 starts at six positions (34g in LF, 17g in RF, 16g at 3B, 16g at 2B, 10g in CF, 5g at SS... Had career highs in games (136), at-bats (432), hits (112), doubles (19), HR (14) and walks (20)... On 7/27 at Washington became the 11th position player (12x) in franchise history to appear in a game as a pitcher (1ip, 1h, 1bb).....last: Lyle Overbay (5/19/14 at Atlanta)...Produced a career-high 5 RBI in a 15-2 win on 9/9 at Chicago-NL... Played for Venezuela in the World Baseball Classic (6 games, 0-for-7)... Played for Aragua in the Venezuelan Winter League (6g, .167, 1hr, 5rbi)... Signed a 1-year contract on 1/12/18, avoiding arbitration. Began the season at Triple-A Colorado Springs, where he batted .339 with 1 HR and 11 RBI in 16 games.....contract was selected by Milwaukee on 4/28 (replaced injured Scooter Gennett)...Batted .272 with 13 HR, 56 RBI and 34 stolen bases in 123 games with the Brewers...Made 96 starts at six positions (45g at 3B, 31g in RF, 8g at 2B, 7g in CF, 4g at 1B, 1g at SS)...Was named Brewers Unsung Hero as voted on by members of the Milwaukee Chapter of the Baseball Writers Association of America...Ranked fourth in the National League in stolen bases (34)...Was named Brewers Player of the Month for July (.312, 4hr, 17rbi, 9sb)...Batted .281 (75-for-267) with 9 HR, 37 RBI and 24 SB in 71 games after the All-Star break...Played for Aragua in the Venezuelan Winter League (40g, .373, 3hr, 22rbi, 7sb). Entered the season as the eighth-best prospect in the Tigers organization (Baseball America)...Began the season with Detroit and batted .061 (2-for-33, 0hr, 0rbi) in 22 games• Made 7 starts (3g at 3B, 2g at SS, 1g at 2B, 1g at 1B)...Was claimed off waivers by Milwaukee on 6/2• Batted .270 with 1 HR and 21 RBI in 90 games with the Brewers...Made 59 starts with Milwaukee (46g at 3B, 12g at 2B, 1g at SS)• Batted .284 (61-for-215, 1hr, 21rbi) over his last 81 games after starting 3-for-48 in 31 games...Had a career-high 9-game hitting streak from 6/18-6/30, batting .469 (15-for-32) with 2 RBI...Hit his first Major League home run on 7/12 at Los Angeles with a solo shot off Brett Anderson...Played for Aragua in the Venezuelan Winter League (57g, .298, 8hr, 33rbi, 11sb). Spent the majority of the 2014 season with Triple-A Toledo, batting .287 with 69 runs scored, 32 doubles, seven triples, six home runs and 53 RBI in 133 games with the Mud Hens...Rated as the best defensive shortstop in the International League by Baseball America...Finished fourth in the International League with 157 hits, while he was tied for fifth with seven triples...Collected a season-high four hits on April 13 at Louisville -- equaled the high on May 22 at Lehigh Valley, June 3 at Buffalo, June 12 versus Buffalo, July 13 versus Pawtucket, and August 14 versus Indianapolis...Tabbed the International League Player of the Week for the week ending June 15 after batting .500 (12x24) with five doubles, a triple, one home run and six RBI in six games during the week...Compiled a season-high 14-game hitting streak June 18-July 3 -- batted .377 (23x61) with five runs scored, four doubles, one triple, one home run and five RBI during that stretch...Batted .343 (37x108) with 14 runs scored, nine doubles, two triples, three home runs and 14 RBI in 26 games during June...Recorded a season-best three RBI on July 17 versus Louisville...Hit .345 (38x110) with 17 runs scored, five doubles, two triples, two home runs and 12 RBI in 27 games during August...Recalled from Toledo by the Tigers on September 1...Appeared in eight games with the Tigers in September, batting .200 (1x5) with one run scored. Spent the majority of the 2013 season with Double A Erie, batting .301 with 28 doubles, two triples, four home runs, 35 RBI and 24 stolen bases in 87 games with the SeaWolves...Finished eighth in the Eastern League with a .301 average and was named to the league's postseason All-Star squad...Rated as the best defensive second baseman in the Eastern League by Baseball America...Recorded a season-high four hits with Erie on April 18 versus Trenton...Had his contract recalled from Erie by the Tigers on July 9...Connected for the first triple of his major league career on July 23 at Chicago's U.S. Cellular Field -- knocked a career-high two RBI that same game...Compiled a career-high six-game hitting streak July 23-31, batting .421 (8x19) during that stretch...Optioned to Triple A Toledo by the Tigers on August 2...Recalled from Toledo by the Tigers on August 5 -- appeared in seven games with the club before being optioned back to Toledo by the Tigers on August 12...Hit .299 (20x67) with three doubles and four RBI in 16 games with Toledo this season...Recalled from Toledo by the Tigers on August 31...Appeared in 12 games with the Tigers in September, batting .100 (1x10) with two runs scored during that stretch. Spent the majority of the 2012 season with Single A Lakeland, tying for fifth in the Florida State League with 27 stolenbases. ... Led all Florida State League second basemen with a .979 fielding percentage. ... Collected a season-high four hits on May 9 versus Palm Beach. ... Recalled by the Tigers from Lakeland on June 9 -- made his major league debut that day as a pinch-hitter at Cincinnati. ... Collected his first major league hit on June 10 at Cincinnati, an infield single off Alfredo Simon. ... Optioned to Lakeland by the Tigers for the remainder of the season on June 10. ... Hit .398 (33x83) with five doubles, two home runs and eight RBI over a 24-game stretch July 14-August 5. ... Batted .307 (43x140) versus lefthanded pitchers...hit .239 (72x301) with righties on the mound. ... Hit .308 (36x117) with runners in scoring position. ... Saw action in seven games during the Florida State League playoffs, hitting .296 (8x27) with three doubles, a triple andthree RBI. ... Played in 41 games with Caracas in the Venezuelan Winter League following the season, hitting .222 (20x90) with twodoubles, a triple and 12 RBI. Selected to both the Midwest League's mid- and post-season all-star squads with Single A West Michigan in 2011...Finished fifth in the Midwest League with 503 at-bats...Tied for the lead among all Midwest League second basemen with 55 double plays...Collected a season-high four hits on April 13 versus Great Lakes...Batted .329 (23x70) in 20 games during April...Hit .330 (36x109) in 28 games during May -- tied for third in the Midwest League with 36 hits, while he finished seventh with a .330 batting average...Compiled a season-best nine-game hitting streak June 17-29, batting .297 (11x37) with a double, two home runs and five RBI...Named the 30th-best prospect in the Tigers organization following the season by Baseball America...Saw action in 18 games with Salt River in the Arizona Fall League following the season, hitting .302 (19x63) with six doubles and nine RBI...appeared in four games with Caracas in the Venezuelan Winter League following the season. Topped all Midwest League shortstops wih 615 total chances, 200 putouts and 380 assists as he spent the entire 2010season with West Michigan...Hit .304 (28x92) with six doubles, two home runs and 21 RBI in 26 games during August. Saw action with the Gulf Coast League Tigers, West Michigan and Single A Lakeland during the 2009 season...Assigned to the Gulf Coast League Tigers to begin the season -- batted .324 (12x37) with five doubles, a triple and five RBI in his first nine games of the season June 23-July 6...Had his contract transferred from the Gulf Coast League Tigers to West Michigan on July 13 -- saw action in 12 games with West Michigan before his contract was transferred back to the Gulf Coast League Tigers on July 28...Had his contract transferred from the Gulf Coast League Tigers to Lakeland for the remainder of the season on August 11 -- hit .288 (15x52) in 14 games during August with Lakeland...Saw action in two games with Caracas in the Venezuelan Winter League following the season. Made his professional debut with the Venezuelan Summer League Tigers during the 2008 season...Led the Venezuelan Summer League with 265 at-bats, while he tied for second with 68 games played and tied for third with four triples...Topped all league shortstops with 341 total chances, 88 putouts and 231 assists. December 4, 2017 3B Hernan Perez assigned to Tigres de Aragua. November 1, 2016 3B Hernan Perez assigned to Tigres de Aragua. June 24, 2016 Milwaukee Brewers activated 2B Hernan Perez from the paternity list. June 21, 2016 Milwaukee Brewers placed 3B Hernan Perez on the paternity list. April 28, 2016 Milwaukee Brewers selected the contract of 3B Hernan Perez from Colorado Springs Sky Sox. 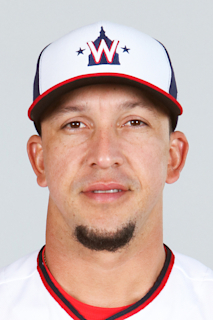 January 30, 2016 3B Hernan Perez assigned to Venezuela. November 17, 2015 3B Hernan Perez assigned to Colorado Springs Sky Sox. November 16, 2015 Milwaukee Brewers signed free agent 3B Hernan Perez to a minor league contract and invited him to spring training. November 6, 2015 Milwaukee Brewers sent 3B Hernan Perez outright to Colorado Springs Sky Sox. October 10, 2015 3B Hernan Perez assigned to Tigres de Aragua. June 2, 2015 Milwaukee Brewers claimed 2B Hernan Perez off waivers from Detroit Tigers. June 2, 2015 Milwaukee Brewers activated 3B Hernan Perez. November 6, 2014 SS Hernan Perez assigned to Aguilas del Zulia. September 1, 2014 Detroit Tigers recalled 2B Hernan Perez from Toledo Mud Hens. March 25, 2014 Detroit Tigers optioned SS Hernan Perez to Toledo Mud Hens. December 8, 2013 Aguilas del Zulia traded 2B Henry Alejandro Rodriguez to Leones del Caracas for 2B Hernan Perez. November 8, 2013 Hernan Perez assigned to Leones del Caracas. August 31, 2013 Detroit Tigers recalled Hernan Perez from Toledo Mud Hens. August 12, 2013 Detroit Tigers optioned Hernan Perez to Toledo Mud Hens. August 5, 2013 Detroit Tigers recalled Hernan Perez from Erie SeaWolves. August 2, 2013 Detroit Tigers optioned Hernan Perez to Erie SeaWolves. July 9, 2013 Detroit Tigers recalled Hernan Perez from Erie SeaWolves. March 19, 2013 Detroit Tigers optioned Hernan Perez to Erie SeaWolves. October 29, 2012 Hernan Perez roster status changed by Detroit Tigers. September 26, 2012 SS Hernan Perez assigned to Leones del Caracas. June 11, 2012 Detroit Tigers optioned Hernan Perez to Lakeland Flying Tigers. June 9, 2012 Detroit Tigers recalled Hernan Perez from Lakeland Flying Tigers. March 15, 2012 Detroit Tigers optioned Hernan Perez to Lakeland Flying Tigers. November 28, 2011 2B Hernan Perez assigned to Leones del Caracas. November 18, 2011 Detroit Tigers selected the contract of Hernan Perez from West Michigan Whitecaps. October 2, 2011 2B Hernan Perez assigned to Salt River Rafters. March 21, 2011 SS Hernan Perez assigned to Detroit Tigers. April 3, 2010 Hernan Perez assigned to West Michigan Whitecaps from Lakeland Flying Tigers. March 22, 2010 SS Hernan Perez assigned to Detroit Tigers. December 18, 2009 2B Hernan Perez assigned to Leones del Caracas. August 11, 2009 Hernan Perez assigned to Lakeland Flying Tigers from GCL Tigers. July 28, 2009 Hernan Perez assigned to GCL Tigers from West Michigan Whitecaps. July 13, 2009 Hernan Perez assigned to West Michigan Whitecaps from GCL Tigers. May 14, 2009 Hernan Perez assigned to GCL Tigers from VSL Tigers.